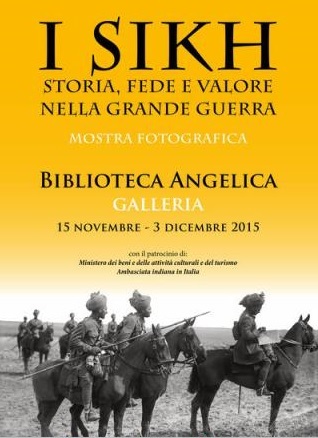 A Photographic Exhibition The Sikhs, History, Faith and Valour in the Great War, will remain open to the public at the Biblioteca Angelica, Piazza di S. Agostino 8, Rome, from 15th November – 3rd December 2015. The current year brings up a historic milestone for the two major wars of the past century: it is both the centenary of the outbreak of the First World War and the 70th anniversary of the Normandy Landing, which was to turn the course of the Second. In the worldwide commemorations that have followed, a tribute of honour has duly been paid to the fallen, known and unknown, who gave their lives in defence of the high ideal of liberty on which the present international equations stand. This sacrifice was made not only by the peoples whose territories were directly drawn into the conflict, but also by soldiers from far-off lands. Among these were the Indians, who gave proof of their valour when drafted into the British imperial armed forces, during the First World War, and, in the Second, as volunteers from the Indian Army bracketed into the English contingents. Among the Indian combatants, the Sikhs were the ones who rendered the greatest sacrifice to the cause of freedom for peoples and places very remote from their own country. outline of the Sikh religion and people. Round Table on the history, art and faith of the took place on Saturday 21 November 2015, Including traditional Sikh musical recital performed by Bhai Baldeep Singh, Founder & Chairman, Anad Foundation from New Delhi as well as presentations on the role of Indian soldiers in the World War including one by Vikram Singh Sodhi (Managing Trustee, Anandpur Sahib Heritage Foundation), entitled ‘Anandpur Sahib and its role in the Sikh martial tradition’. 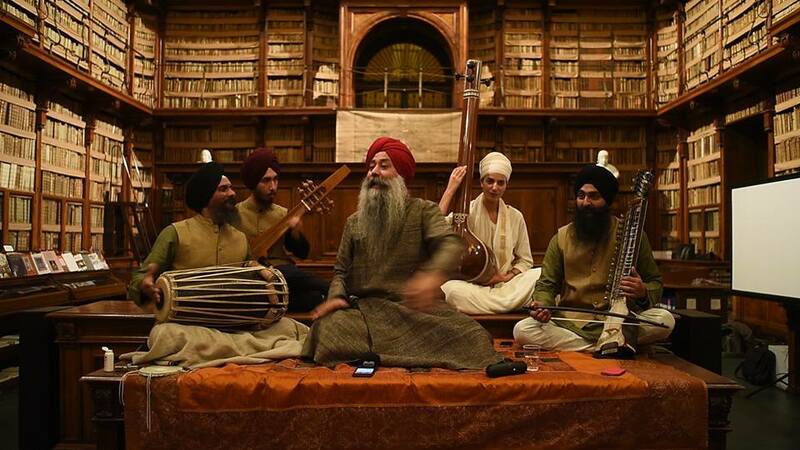 Bhai Baljeet Singh, Accompanists: Parminder Singh Bhamra (Pakhawaj), Vikramjit Singh (Dilruba), Sant Subagh Kaur Khalsa (Tanpura) and Luigi Singh (Dhurpadi Rabab). Photo courtesy of the Anad Foundation. International Institute of South Asian Studies (ISAS), United Kingdom Punjab Heritage Association (UKPHA),in collaboration with The British Library (BL), Anandpur Sahib Heritage Foundation and Anad Foundation.